The Dark Knight and Man of Steel writer gave an illuminating lecture, discussing the moment he felt he was a writer, the importance of gaining life experience and how his persistence paid off. On Monday 23 September, David S. Goyer delivered the first in a series of BAFTA Screenwriters' Lectures in association with JJ Charitable Trust presented annually in partnership with BFI, now in its fourth year. 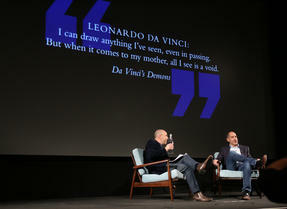 Download the David S. Goyer Screenwriters' Lecture Transcript and Q&A to read them both in full. BAFTA/Stephen ButlerDavid S. Goyer’s own start in the scriptwriting industry sounds a little like a storyline you might come across in a film or TV show. As a plucky twenty year old with nothing to lose, Goyer sat and cold called his preferred agent for forty-five consecutive days. When the agent finally came on the line (possibly to tell Goyer to stop harassing his assistant) Goyer took the opportunity to persuade him to read his script. He then waited a couple of weeks before beginning his phone campaign again. *y writer." Lesson number one from the book of Goyer: Never give up. "It’s rejection. If you can’t deal with it, if you can’t pick yourself off the floor after someone has completely crushed your soul, if you can’t continue onward, then you probably shouldn’t be trying to write for a living." It’s rejection...if you can’t continue onward, then you probably shouldn’t be trying to write for a living. In his early years, Goyer wasn’t about to take himself too seriously either: "everyone wants to write an Academy Award winning film, or a BAFTA winning film their first time out, but there’s nothing wrong with learning your craft in the trenches." Goyer's personal trench was Death Warrant, a nineties action film starring Jean-Claude Van Damme, and while he notes it wasn’t his "finest hour", he’s not embarrassed by it either: "in those days, B movies were a good place to earn your water wings." With his water wings firmly earned, Goyer went back to the office to sit down and write a film without any editorial interference. The result was the Blade trilogy and it’s the screenplay which Goyer cites as the moment when he felt he could finally call himself a screenwriter. He even got business cards printed up as a nod to his new found profession. It wasn’t a move that went down well with his mentor, Nelson Gidding, who threw the card in the bin saying "no writer worth his salt prints up a fcking business card that says writer on it […] it’s bullsht, you’re not a writer, you’re a human being who writes for a living." Which leads to lesson number two from the book of Goyer: get some life experience. 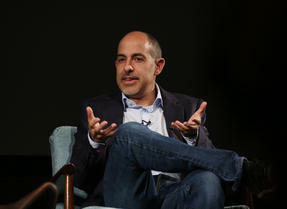 Goyer threw away the cards and went travelling, moving through Africa, Asia and South America. At the time he didn’t see how it might translate back into work, but when he sat down with Christopher Nolan to reinvent Batman it was his time in Tibet that stuck in his head. "I can’t say that the Tibet trip was an easy trip, it was actually a very difficult trip, but I never would have imagined that that trip would become the basis for the beginning of Batman Begins, and it did." I think today is a more exciting time to be entering into the film industry than when I started. BAFTA/Stephen ButlerFast forward a few years and Goyer, with life experience and a number of award winning screenplays under his belt, is undeniably a successful writer - business cards or not. From big budget movies to games and TV series, Goyer has successfully juggled writing for a number of genres and he’s optimistic about the future too. For Goyer the film industry with its writers strikes and budget cuts isn’t falling apart, it’s just that "the work and the opportunities are migrating elsewhere. Believe it or not I think today is a more exciting time to be entering into the film industry than when I started back in 1988. It’s just that now most of the exciting stuff is actually happening on the small screen as opposed to inside multiplexes." Which leads to the third and final lesson from Goyer’s sermon: write what you feel passionate about not what you think the market is dictating. "At the end of the day good writing, and passionate writing, I do believe will always win out. And if you have a card that says ‘Blankety Blank, Writer’ consider throwing it out." The Dark Knight and Man of Steel writer gives an illuminating lecture, discussing the moment he felt he was a writer, the importance of gaining life experience and how his persistence paid off.